Collector marbles have been around in some form since the Roman Empire. Various Roman writers mention marbles throughout their works, and archaeological digs have uncovered early marbles made from clay and then baked in primitive ovens. These marbles often had markings to distinguish them as belonging to one person, and they were used in all types of games. Throughout the next several hundred years, artisans fashioned marbles out of wood, stone and other materials. These marbles had to be cut and molded by hand, which made them more expensive than most people could afford. In 1848, a German glassblower determined a way to make marbles out of glass with a more efficient method. He developed a tool, called a marble scissors, that would allow him to make marbles quickly so that they could be sold to the general public. The United States became a hot marble market quickly, but that took a downturn when World War I ended German imports. American glassblowers stepped in to find a way to mass produce marbles. They developed machinery to do it, and manufacturers still use these types of machines to drop out marbles quickly. Collector marbles come in all sizes. 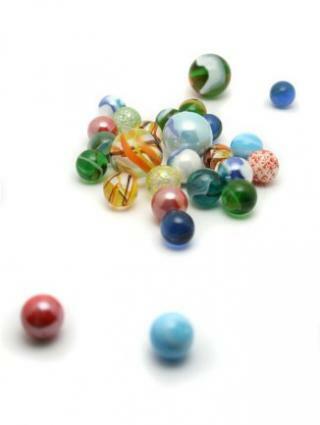 Though the standard used in children's play is about one-half inch in diameter, marbles do come in many other sizes as well. Collecting marbles is about finding unique designs and rare availability. Several factors go into making this determination. Marbles will be worth more money if they are completely rounded. For older marbles, the roundness indicates the amount of time an artisan put into making the toy. More time means a better shape and more value. With newer models, perfectly round marbles have been well-kept. Because the marbles are machine-made, they start out round but can get chipped over time. Today's marbles are pretty basic. They are made of agate or glass and come in all colors and designs. There are thousands of marbles of each design produced. Marbles of yesteryear, though, are more unique. Collector marbles that are very rare will fetch a larger amount of money. Many of these marbles can be worth hundreds of dollars, with the rarest ones worth thousands. Most marbles do not come in packaging, or they have basic netting bags. Others are sold in tins or boxes, and having these packages intact and with the marble increases the value of the item. The age, manufacturer or artisan and type of material are other factors used to determine the value of collector marbles. The International Association of Marble Collectors serves as an organizing group for the collection of marbles. This group, which is open to individual members pretty easily, puts together several shows a year. At these shows, marble collectors bring their wares, and some offer them up for display. Others sell marbles or sell polishing kits and other accessories associated with the craft. Groups pop up around areas where a number of marble collectors reside. These groups give people the opportunity to go to meetings and shows in their area, which cuts down on the cost of traveling to the large national shows. These groups often have available marble experts or other people who can provide interesting talks about the value of marbles. Another benefit of local marble groups is that they allow the members to connect with other people in real life. One can form relationships that go beyond marble collecting. Going out with the marble group can be the beginning of many friendships. The Internet has made it easier for marble collectors to find each other. Instead of relying on people in their geographic location, collectors can connect with others internationally.